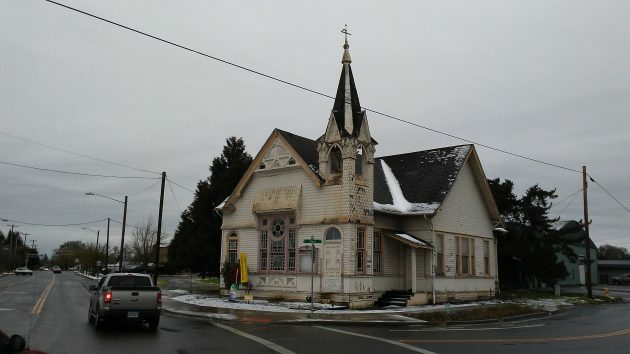 The former church at Santiam and Main as it looked on Dec. 19 under a leaden sky. Passing by the former Cumberland Presbyterian Church the other day, I wondered if there had been any progress on finding someone to take the old place off the Albany city government’s hands. The answer is no, not much has happened since the city council last dealt with the issue four months ago. In August, the council asked the city staff to put out a request for proposals on what to do with the deteriorating building. As I reported at the time, the council urged that this be done quickly. And Councilor Rich Kellum asked that there be few requirements so that it would be possible for someone to come up with a viable plan to acquire and use the property. When I inquired this week, I learned that the city staff was still working on the request for proposals. They hope to put it out in January 2017. The church is turning 125 years old in 2017. The city paid $150,000 for the property in 2000. Officials thought it would be in the way of the Main Street reconstruction project that was then being planned. But the plans changed, and the property, at the junction of Santiam Road and Main Street, was declared surplus. In 2014 the city asked for proposals and got two. For a token purchase price of $111, the council agreed to transfer the property to a non-profit charity that said it wanted to turn the place into a kind of counseling center. Among the conditions was that the deal would go through the land-use approval process. But no one followed through, and nothing happened. At the time, estimates for repairing the building ranged from $150,000 to $240,000. In the meantime Universal Coffee, in the Carriage House Plaza across Santiam Road, has been renting the building for storage. Alex Contreras, who runs the coffee shop, told me a year or so ago he’d like to turn the old church into a combination coffee house, art and music venue and community center, a place where Latinos and the rest of the community would come together. It’s a beautiful old building but you can’t save everything just because it’s old (I should know!). If progress can’t be made soon it might be time to raze the structure and make way for something else. It seems fairly indicative when Hasso mentions that City Councilor Kellum was interested in creating as few barriers as possible for potential business development in the old church building, yet as Hasso pointed out on more than one occasion, Kellum seemed fully intent on delaying the implementation of zoning rules for cannabis businesses, only bowing to the will of the people when his position became untenable. Kellum would throw the doors open to development of the church property unless, of course, it were to become a recreational cannabis outlet. I simply love this historical Church. I have a beautiful picture taken in the fall of 2007 that I cherish. I wish someone would restore it to its glory.